There are dozens of Baroque churches in Vienna, most of which were built just after the Second Siege of Vienna (by the Ottoman armies in 1683). Five of these churches are particularly outstanding: The Karlskirche, the Jesuite Church, the Peterskirche, the Piaristenkirche and the Salesianerinnekirche - four examples of late or high-Baroque architecture. 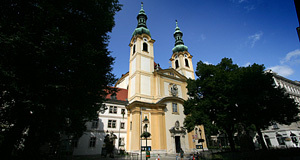 If you want to see where this style came from, watch out for early Baroque churches, of which there are few in Vienna. The Servitenkirche in the 9th district of Vienna (Alsergrund) served as a direct model to the Salesianerinnenkirche, the Peterskirche and the Karlskirche and therefore, plays a key-role in the development of the Viennese style of high-Baroque architecture. In 1638, Emperor Ferdinand III invited the Servite order - a reformed branch of Augustinian monks - to found a monastery in the neighbourhood of Rossau just north of the city of Vienna. The Servites had already tried to settle in Vienna in 1624, but failed - it is very likely that they were later supported by Prince Octavio Piccolomini. In 1639, a provisory church made of wood was opened. In 1651, the Servites had raised enough money to start building a proper church - partly due to the financial support of Prince Piccolomini. The architecture was modelled after the state-of-the-art style of the Italian architect Palladio, adapted to Viennese needs by Martin Carlone. The new Servitenkirche was groundbreaking in its style and elliptical outlay; the church was opened in 1670. The completion of the interiors took another seven years - and the twin-tower of the Peregrinus Chapel were built only in the later 18th century. The interiors are arranged in four niches for altars, one of them depicts a pieta and is the tomb of Prince Piccolomini - the altar dates back to 1470. A second altar was donated by Sir Christoph of Abele, another benefactor of the Servites in Vienna. When the Ottoman troops attacked Vienna in 1683, Abele invited the Servite monks to stay in his private house in the city - protected by the city walls. Surprisingly, the Servitenkirche Church survived the siege with only marginal damages - which is unusual, since almost all buildings of significance in the immediate surroundings of Vienna were destroyed by the Turks. Servite monks regard St. Peregrinus very highly - a chapel along the main nave of the Servitenkirche is dedicated to him - the "Peregrinikapelle", built in the 18th century. St. Peregrinus is the patron saint of people who suffer from foot or leg problems. Note also the "Galgenkreuz" cross on the right hand side of the main altar - it was originally located at the execution site of Vienna and dates back to the 13th century. Today, the Servitenkirche is still in monastic use, but it is also a Parish church. The cloisters are open to the public and worth a closer look. Attractions nearby include the Liechtenstein Museum, the Berggasse with the Sigmund Freud Museum, the Rossauer Kaserne and the Ringstraße; and - further away - the destructor of Spittelau, the Altes AKH, the Votivkirche and the Josephinum.